Motivated by the beneﬁts, people have used a variety of web-based services to share health information (HI) online. Among these services, Facebook, which enjoys the largest population of active subscribers, has become a common place for sharing various types of HI. At the same time, Facebook was shown to be vulnerable to various attacks, resulting in unintended information disclosure, privacy invasion, and information misuse. As such, Facebook users face the dilemma of beneﬁting from HI sharing and risking their privacy. In this SOUPS ’16 paper, we report our investigation of HI sharing practices, preferences, and risk perceptions among US Facebook users. 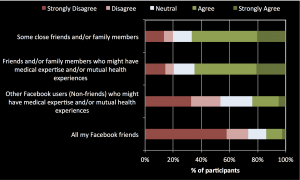 We interviewed 21 participants with chronic health conditions to identify the key factors that inﬂuence users’ motivation to share HI on Facebook. We then conducted an online survey with 492 Facebook users in order to validate, reﬁne, and extend our ﬁndings. While some factors related to sharing HI were found in literature, we provide a deeper understanding of the main factors that inﬂuenced users’ motivation to share HI on Facebook. The results suggest that the gained beneﬁts from prior HI sharing experiences, and users’ overall attitudes toward privacy, correlate with their motivation to disclose HI. Furthermore, we identify other factors, speciﬁcally users’ perceived health and the audience of the shared HI, that appear to be linked with users’ motivation to share HI. Finally, we suggest design improvements— such as anonymous identity as well as search and recommendation features—for facilitating HI sharing on Facebook and similar sites.